This is taken from a talk I gave at the Art League of Long Island. My piece 80 Winthrop Street. embodies this wabi sabi saying. 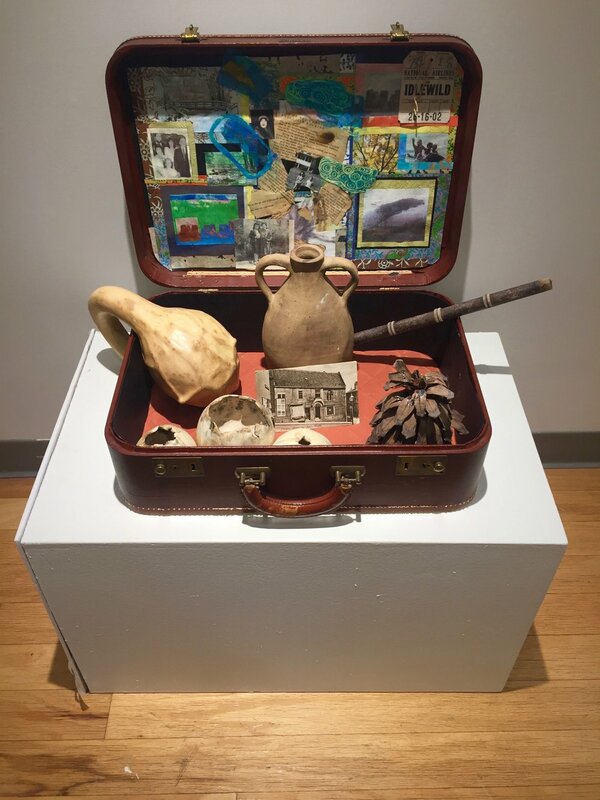 It is an artwork made from a found valise containing several items, including a postcard, a pinecone, a gourd and clay vessels. Nothing lasts –Someday everything around us will decompose, some sooner, the pinecone and the gourd and some later the bamboo stick and the valise itself. I found that valise on the street several years ago and it became the container for my first assemblage. Nothing is finished – Nothing we see is complete. Things are constantly changing even if we can’t see it. I am always making changes to my pieces. I keep on adding whenever I come across something that I think would be work in an assemblage. I recently added a baggage ticket from Idlewild airport to 80 Winthrop Street. I enjoy making assemblages because I am always finding new things to add. Nothing is perfect- No one we know, no objects we own, no situations we find ourselves in are faultless. I don’t strive to have perfect items in my assemblages. I don’t have a set plan when I put them together. But I do spend a lot of time arranging rearranging so that the objects are in a conversation with each other. Maybe we are the last generation to have our experiences tied to physical objects –future generations histories will be online. I still feel the need to tell my story through a few resonant objects. This is my story of 80 Winthrop Street. It is the story of my grandmothers’ journeys. One grandmother was born in Poland and made a trip across the Atlantic in 1920 to live in America; probably she was carrying a valise like the one in my piece. My other grandmother was born in the United States and made the much shorter trip every weekend from her apartment on 80 Winthrop Street in Brooklyn to visit my family on Long Island. I remember her carrying a valise like the one above. If you take a look at the collage on the inside back of the valise you will see photos of both my grandmothers. 80 Winthrop Street is also the story of my own pathway through life. There are images of my family, trips I have taken and bridges I have crossed. It also shows my life’s voyage through clay. I started working in clay when I was in college and have continued ever since. Sometimes I work on the wheel creating functional pottery; other times I make tile wall reliefs. Now I find myself making assemblages and wall sculptures that might have many elements but always include something I have made from clay. Clay never gets old to me. It is an ancient art form that can look very modern. I decided to include a clay vessel in 80 Winthrop Street that is modeled on the kind of vessel that women in ancient times would take to the well and fill with water. I want my piece to have the feel of reaching across time. 80 Winthrop Street with recent changes at the Echoes exhibition at the Art League of Long Island.